Her only respite from the chaos is her work. But while conducting a pre-trial investigation in the Olympic Peninsula, she witnesses the ghostly echo of a fatal car accident for which there are no records. Worse still, the victim of the wreck insists he was actually murdered, and that the nearby mountain resort—called “Blood Lake” by locals—is to blame. Downpour is the sixth book in the Greywalker Novels. Let us first say that Una has not read any of the previous books, however, Gikany was able to read the first book in the series. Even though there are references to previous experiences and moments, we feel it isn’t necessary to read the first five books to enjoy this one. However, to get the full impact of the series, we would recommend starting from the beginning. Downpour starts off with our heroine, Harper Blaine, doing some less than fabulous legwork for a pretrial hearing. During the course of this, she runs across some strange creatures and power lines in the Grey. The Grey is an alternate, paranormal dimension that Harper can experience and witness ever since she died (in a previous novel). These events cause her to take a deeper look into her surroundings, which leads her to a ghost and a murder mystery. What could be classified as a straight-laced detective drama/mystery is made more suspenseful and engaging with the element of the paranormal. It creates a thoroughly grounded but surreal urban fantasy. Gikany and Una enjoyed Downpour. The mythology is very interesting and the way the paranormal is weaved into this urban fantasy is mesmerizing. The mystery was a bit simple (there were some obvious clues) however it did not detract from the overall intrigue of the world, Ms. Blaine’s abilities, or the resolution of the mystery. Ms. Richardson’s descriptions are quite vivid giving what is called the Grey a picturesque feel even with the threat of power it holds. Harper Blaine is fresh and fascinating. It seems we have another world where our main character has found herself suddenly in an alternate reality of which she now must be a guardian. Because of the interesting allusions made to what we assume happened in the previous novels, Una and Gikany are eager to read the previous novels. We especially want to see how she deals with the changes that have occurred to her abilities in the Grey. Harper is down-to-earth, funny, but with a strong edge that makes it so easy to walk in her shoes. Considering how little advice her “boss” in the Grey gives her, it is amazing to watch as she makes her way in this world. Downpour is well paced and hard to put down. We found it to be a gripping, nail-biting page-turner. With the vivid illustrations of the Grey, it truly makes it effortless to find yourself in this world. Gikany and Una have added this to our “series to follow” and look forward to seeing what happens to Harper in the next Greywalker Novel. 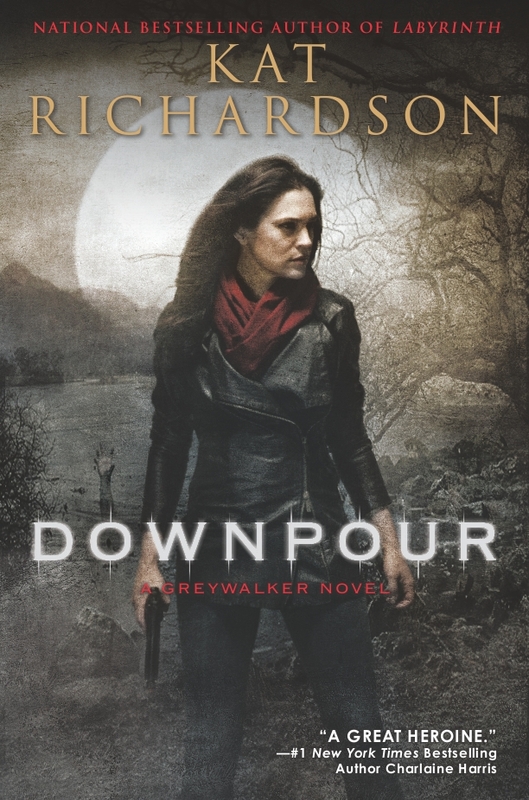 GIVEAWAY: I will be giving away one (1) copy of Downpour by Kat Richardson starting today. All you need to do is leave a comment at the end of this post to enter. You do not need to be a GFC Blog Follower, but it is appreciated. Contest is open to United States mailing addresses only. Contest runs until Thursday August 4, 2011 at 9:00 PM EDT. If your email is not part of your profile, please leave it so I may contact the winner. One entry per person. One (1) winner will be selected from eligible entries using random.org. I am not responsible for items lost in the mail. Pssst… be sure to read the comment section for a little bonus to this giveaway! Great post and love the giveaway. I love Kat Richardson!! This is so lovely of you! Thanks. if you like, I can send the winner a signed bookplate for their copy. Have not read Kat Richardson…am looking forward to reading her books after reading these reviews! Usually when jumping into a well established series, the having “missed out” on the earlier books typically hurts the reading. It didn’t this time…there was enough information to understand and continue with the story, but missing just enough to make you wan to go back and read the other books. I love this series! I can’t wait to see what Kat puts poor Harper Blaine through this time. One of my favorite series. I always await the next book eagerly. Love the giveaway idea! Kudos. Love this series so much!I always pre-order it! Awesome review! Sounds like a great book and a great series. Kat, you rock adding your special addition to this giveaway. I love the Greywalker series! Great review, I am so happy they are still going strong. I just finished #3. Thanks for the giveaway! I haven’t had a chance to get started on The Greywalker Novels yet, but the more I hear about them, the more excited I am to get started reading them. I’m always looking for a good urban fantasy series to get into and the Greywalker series looks awesome! Please count me in. Wow, glad I stumbled on this blog. This series sounds right up my alley. I will definitely have to check it out – and great review! Can’t wait! will be a follower (ha, so not something I have ever said) after this is posted! This series sound amazing. Thank you so much for the chance to win! Thanks for sharing the great review and giveaway chance! Cool giveaway! I’m up to book 4 in the Greywalker series. I love it! Looks like I have some catching up to do on the Graywalker series. I just learned about Richardson from some of the other spec fic authors I follow on Twitter, who give her ringing endorsements. I remember reading the first book in the series and I think I have one or two others sitting around. This would be a good excuse to get back into it. Thanks for pointing out that you don’t have to read the books in order.